A SERVAL has received the all clear by a biosecurity veterinarian and has been released the animal from quarantine at the Darling Downs Zoo. The Darling Downs Zoo has worked closely with the Department of Agriculture to manage the biosecurity clearance of the African wild cat . The department is responsible for overseeing animal imports to manage the risk of exotic pests or diseases coming into Australia. The long-legged spotted wild cat is native to Africa but was raised in captivity in New Zealand and imported to Australia a month ago. 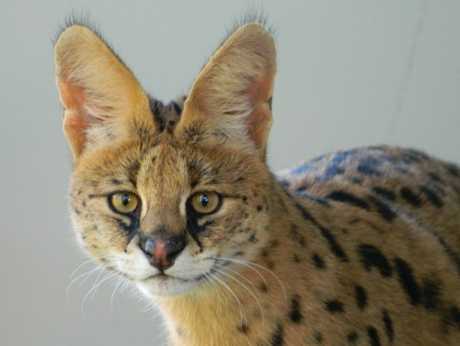 The serval spent its first 30 days in a quarantine environment away from other animals where zoo keepers had put measures in place to contain and manage any biosecurity risks. As a part of the offshore biosecurity process, the serval underwent vaccinations and health monitoring in New Zealand before travelling to Australia. Department of Agriculture north east regional manager Tina Hutchison said the biosecurity process ensured the zoo community, as well as the native environment and animals, were kept safe from biosecurity risks. "Australia is free from a number of biosecurity risks found elsewhere around the world. "Our biosecurity conditions are based on science and protect Australia from unwanted pests and diseases," Ms Hutchison said. "Animals from overseas can carry diseases such as rabies and hitchhiking pests like worms and mites. "Zoo animals are a lower risk, but still have the potential to pass on diseases and hitchhiking pests to local birds or wildlife. "We work closely with all sorts of animal importers to ensure that the biosecurity risks are managed, from residents importing their pet cats right through to Australian zoos importing rare animals."